My hangar is 40 feet wide. It's big, until you try to fit a roughly 36-foot wingspan plane in it. 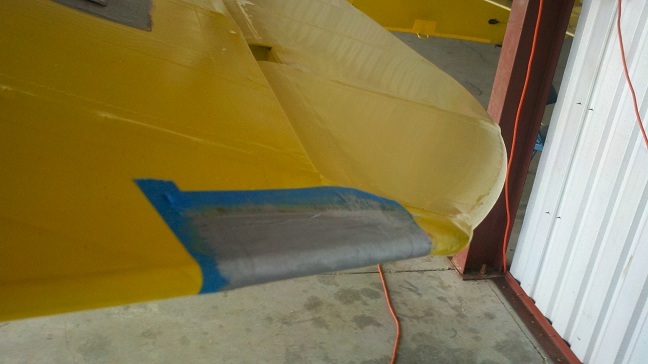 When I called my IA to confess, he wisely suggested I get some red duct tape, and mark the outer limit for each of the mains when rolling her in - and then, much as when landing her, make sure she's always going straight and centered when I roll her into the hangar. I stopped as soon as I felt the contact - but 800-odd pounds of airplane, while very light for an aircraft, still has a momentum all her own. Nothing left to do but carefully straighten her out, put her away, and checked to make sure nothing was structurally wrong (there's a lot of torque that can be applied to a huge wing like that). 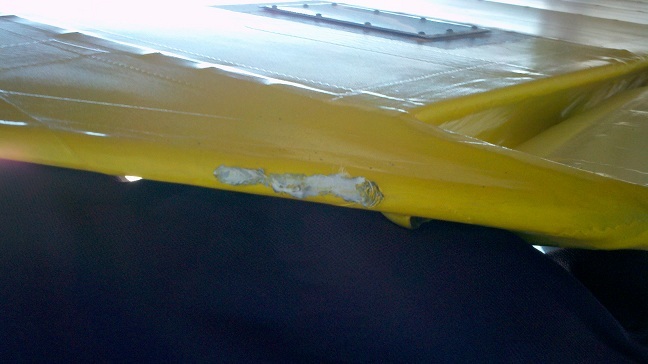 Then, breaking out the book used through all the wing covering, I carefully read the section on patching. First step is to clean off the old dope, right? Well, no. First step was to find, unpack, check, or order all the supplies. By the way, Aircraft Spruce will remember your order info, years after the fact. Also good to know - Aircraft Spruce has a demonstration kit, set up to show you how incredibly easy it is to ribstitch and dope fabric airplanes, and why you too should think this is awesome and decide to cover your airplane. While they send a heavy fabric instead of a light one, this means that all the dopes (and MEK) show up in one nice box in pint-size sample cans, more than enough for all the patches I could never want to do... for far less money than buying them individually otherwise. I did splurge and sprung for a quart of the color coat, so at some point all my patches will match my wings. Okay, after it all arrives, calibrate the hobby iron, open the hangar doors to get a good breeze circulating, pray to G-d that not many mosquitos get stuck in your dope this time around (don't ask), glove and mask up, marke off the area with masking tape, and start scrubbing the entire patch area clean with MEK. Change gloves more often than you think you need to - gloves are cheap, MEK is nasty. When you're tired or finished, take off gloves and mask, pitch in camp chair under a wing, and stroll to the FBO for a can of soda, enjoying the fresh air, sunshine, and airplanes. 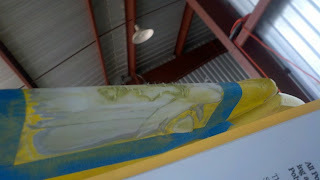 Come back, realize you need more surface area cleaned off, set new masking tape, and repeat. When the fabric is cleaned, cut away a few crumpled ragged edges and threads, and then cut a patch to overlap. Put it on, realize you're working on a curved surface, take off and readjust with judicious cutting. Think for a bit, cut a second patch to fit much better. Cement on. Take calibrated iron and iron spots not cemented down, which is strangely more than you'd think on a wingtip bow patch (as in, there was some). Go get another soda. Come back, carefully pour base dope into a jar that's easier to dip brush into, and look a little dumbfounded. Remember that you did your entire wings with untinted dope, but that's right, Poly-Stits is usually a pink base. Laugh, mutter to the plane that she's not to go showing her pink parts to the world, apply dope carefully. Put everything away. Get another soda while it cures (yes, cures, not dries), try not to inflict humor on passing pilots. Crack open the silver coat. Silver is a dope coat full of powdered aluminum - it's a heavy coat, as in weighs what you'd think when there's metal powder in that enamel, but should be applied in multiple very light coats. In fact, it really should be sprayed on, but this is not a show plane, and I don't have a HVLP sprayer or the air compressor to run it just yet. I do have a brush, and an airplane meant to be loved for her flying, not her looks. So, after stirring the silver, I pour a little into a can to use when brushing it on, and start applying light coats. As one coat cures, I walk around the airplane, looking for anywhere else that might need a little more silver to protect the fabric from the UV. 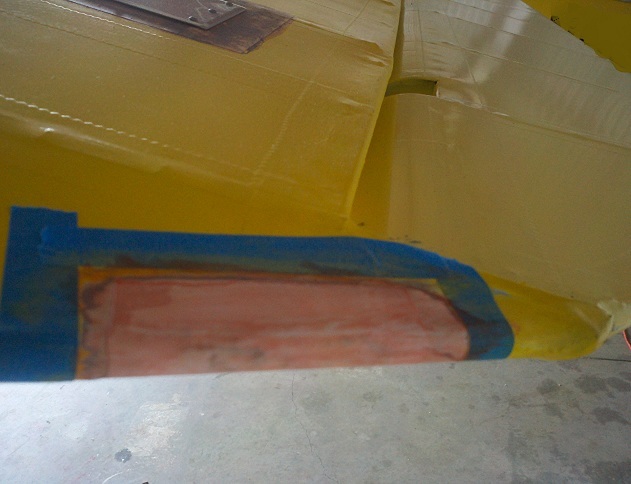 Several rounds later, she looks good enough to functionally fly, if not as pretty as she used to be. She'll do. Hopefully, her pilot has now gotten that stupidity out of her system, and never again shall the hangar door post and the airplane meet. Meanwhile, congrats on conquering yet another task. It's a labor of love, isn't it? Woodworking companies like Rockler sell an all-in-one kit with a mini-compressor, which might be a lot cheaper than buying a general purpose shop compressor. OTOH, you might WANT a general purpose shop compressor - I know I use mine weekly. Rev - yeah, you'd think after covering the wings, patching would be easy - but it's a separate, though related task. Not hard, just different. And face-palm inducing, once the immediate meep! and thorough damage check is done. DB - It is, it truely is. NFO - I could make a comment about payback for sinal coffee rinses you've given me, but that would be a declaration of a war I'd lose. So, I'll just say, "You're welcome!" I did the duct tape immediately, then checked my hangar contract about painting the floor. There will be painted lines by this evening, unless I get distracted by flying. I've asked the airport manager if I can paint red warning stripes on the apron of my hangar. It's like putting a bandaid on the head of a beloved child that fell down. Painful yet rewarding in its care. I categorically deny having ever done that to a C-141 Starlifter. Could this help with your hanger rash? ?